Exporter of a wide range of products which include carved marble durga moorti, carved marble durga murti, carved marble durga statue, durga ma statue, durga statue and ambe mata. 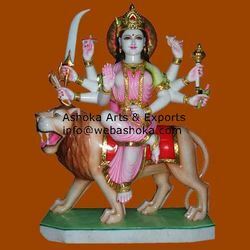 We manufacture and supply exceptional quality statues of Goddess Durga Godess Kali, who is considered to be the unified symbol of all divine forces, an incarnation of Mother Goddess. 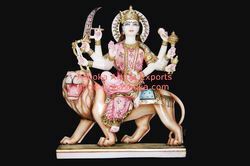 The elegant and attractive Marble Durga & Kali Mata Statues offered by us are carved out by expert artisans who have vast knowledge and experience in this field. 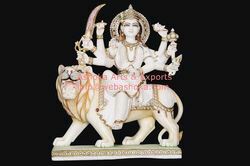 White Marble Durga Mata statue is light in weight and which can which can be customized as per the specifications provided by the customers. These statues are available in different textures and look very attractive. These Lord Durga statues are also available in diverse sizes and which are used to kept at hotel entrances, guest rooms, cottages, embassies, homes etc. The color combination which we use to decorate the idol are a great match in making the lord Durga. Maa Durga, the supreme mother of all the three worlds. Destroyer of demons and delighter of devotees. Endowed with eight arms, riding on her vahana lion. Painstakingly carved marble statue of Maa Durga confers blessing to all her devotees. 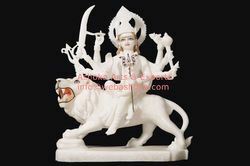 Splendid and charming piece of Marble Durga Statues. We manufacture and supply exceptional quality statues of White Marble Goddess Durga, who is considered to be the unified symbol of all divine forces, an incarnation of Mother Goddess. 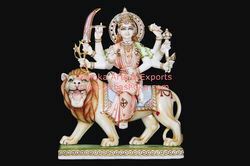 The elegant and attractive Marble Durga & Kali Mata Statues offered by us are carved out by expert artisans who have vast knowledge and experience in this field. The Kali Mata statue offered by us is intricately designed and crafted. It eliminates negative energy and keeps the mind alive and fresh. These elegantly designed idols are colored with metallic colors and gold highlighting is used to depict jewelry. We offer a captivating idol of Durga, which is worshiped as the symbol of power and strength. This deity is skillfully carved with premium quality marble and is painted in vibrant colors. The sculpture has goddess Durga, sitting on a tiger with her hand in the posture of blessing. Clients reckon this statue for its intricate design, perfect finish and polished looks. 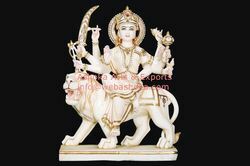 Looking for Marble Durga ?